Salted Caramel Macaron - Let the Baking Begin! Out of 3 different flavor combinations that I made that day, these were the best, but that’s not much of a surprise, caramel is one of my favorites! 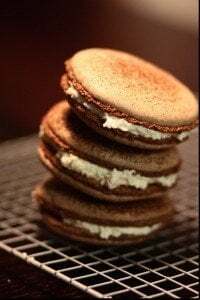 Dulce de Leche Macarons – Italian Macaron Shell recipe and dulce de leche as the filling. 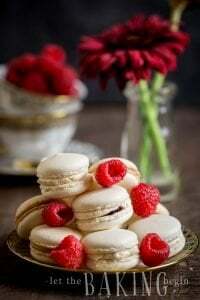 White Chocolate Raspberry Macarons – Simple Italian Meringue Macaron shells, White Chocolate Ganache, and a fresh raspberry. Line 2 jelly roll sheets with parchment paper or silpat. Prepare a piping bag with a 1/2 inch round tip. Start whipping the egg whites with a pinch of salt. Once foamy, start adding the granulated sugar and whip until stiff peaks form. Add the food coloring. Mix to somewhat incorporate. Add 1/2 the powdered sugar mixture and with a very quick mixing motions, make about 5-6 swirls with a spoon, to somewhat combine the meringue with the powdered sugar mixture. Add the other 1/2 of the dry ingredients and carefully fold it in until fully combined. Take care not to overmix. Stop when the batter falls in a thick ribbon and disappears in about 30 seconds. Fill the piping bag with batter and pipe out 1 inch circles onto parchment paper. Sprinkle half of the piped circles with sea salt. Slide the first sheet in the oven and bake for 10-12 minutes. Do the same with the second sheet once the first one is done. Let them cool. Carefully peel off the half cookies by just lifting them up, or using a thin knife slide right under each cookie to release it. Combine the sugar and water in a small saucepan. Turn your stove to medium heat. Cook the syrup to soft ball stage (that’s when a drop of syrup, dropped into a glass of water can be formed into a soft ball). Whip the egg to soft peaks. Carefully pour in the syrup between the whip attachment and the bowl while continuing to whip. Whip until the bowl feels cool to the touch. Meanwhile, whip the room temperature butter to whiter in color and fluffy, about 2 minutes. When the egg has cooled, continuing to whip, drop 1 tablespoon of butter at a time. The mixture might become runny and might look curdled, continue to whip and it will come together into a smooth buttercream. Set aside. Heat the cream and keep ready to be combined with the syrup. Combine the water with sugar and cook at medium heat, until amber in color. Be very careful to not overcook the syrup, as when it starts turning slightly amber it will take about 30 seconds to go from good amber, to burnt amber (unusable). Take off the heat. Slowly add the heavy cream into the syrup, keeping your hands as far as possible from the steam cloud that will form as soon as you start adding warm milk to extremely hot syrup. Once the bubbles have subsided, start mixing with a wooden spoon, to form a homogenous caramel. Let cool to room temperature. Start whipping the butter cream again. Add the caramel into the buttercream, 1 tablespoon at a time, until smooth, but still some chunks of caramel present. The buttercream will become a little bit more runny then in the beginning, but that’s ok. Sandwich the cookies with a dollop of caramel buttercream. **I used Hawaiian Black Salt and Hawaiian Red salt. Hello marina, is there any way that I can freeze these macaroons? To freeze baked macaroons it is important to first allow the cookies to completely cool on parchment paper or a baking rack. The cookies can then be stored in an air tight container or plastic bag and placed in the freezer. Hello Marina, I was wondering if theres any way that i could put just carmel into the macaroon instead of adding it to the buttercream? Will it be to runny if I do that? You could try, but I think the caramel will try to ooze out and make a huge mess. 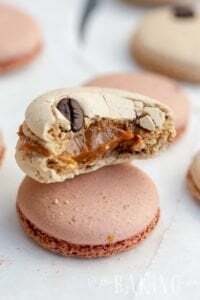 You can try cooking caramel for longer, to make it less runny but I think then your macarons won’t be as soft and fluffy. I cannot find the recipe? I apologize Natalia, I’m not sure what happened that the recipe disappeared. I fixed it, now it’s up. There’s no difference in the stliabity of the foams as far as I know. At least I’ve never noticed any, and I’m not aware of any degradation in egg proteins as a result of aging them. Perhaps another reader might have some insight into this. Anyone? I don’t know why I just now noticed your comment. Hi, I have a question about the sugar.. It says you’re using confectioner sugar.. 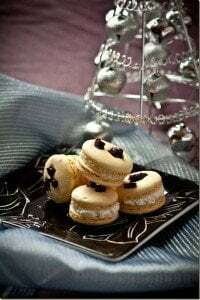 But the macaron books I’ve read calls for caster sugar/bakers sugar. Are the ones you using the powdered sugar (the one that goes into frosting)…. Or is it indeed caster sugar. Sorry if that sounds confusing. Hi Michelle, Sorry for taking this long to respond, your comment was sent to spam folder by mistake. No my recipe calls for confectioners or powdered sugar, it is not the same as caster sugar. Hope this helps. 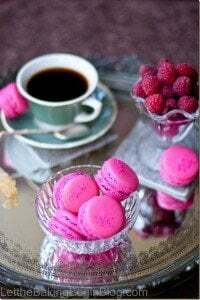 Hi I was interested in how you kept the topping on the surface of the macaron. did you add before baking?